Welcome to the July 2008 edition of the IPC e-newsletter. The IPC e newsletter is distributed free to more than 3000 people around the world. India Powder Coating is visited by a large number of visitors. How do these peop le reach us? The adjacent pie chart shows the details. 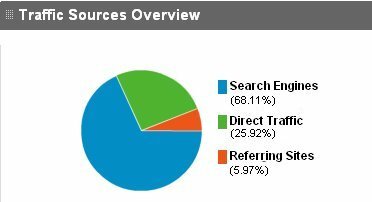 (source www.google.com/analytics ). Thanks to all the visitors and subscribers for these impressive figures. Up to 99 percent of powder overspray can be captured and recycled. No solvents to mix or recover. No viscosity balance to maintain. No need to provide heat booth make-up when air is returned to work area. Readily available resins can provide one or a combination of desirable characteristics including: durability, resilience, high gloss, electrical insulation, toughness; and resistance to wear, corrosion, impact, chemical action, and weather. Powder manufacturers now offer a complete range of colors plus excellent color matching. Consistent finish characteristics and electrostatic wrap-around reduce the need for highly skilled operators. Process is easily automated and can include automatic gun movers and/or contouring mechanisms. Production time can often be reduced, as one coat will do the job. for several hours, heat curing can be done at the users convenience. Should the uncured powder coat become damaged or blemished during handling, the powder can be simply blown off with air or vacuumed, and a new coat applied. An electrostatic powder coating system is comprised of a powder feeder, power unit or electrostatic voltage generator, electrostatic spray gun(s), and a powder recovery system. sufficient discharge pressure and velocity to feed a gun as remote as 50 feet away. is propelled toward the part. Once charged, the powder particles are drawn and attach themselves to the grounded work piece. The power unit has sufficient voltage to assure maximum wraparound. Voltage is operator adjustable up to 100 kV to minimize Faraday Cage effect when spraying into corners and deep recesses, and to ensure excellent wraparound and surface coverage on all surfaces being sprayed. to the powder. The spray pattern is easily configured to accommodate the type of coating used and the shape of the part being coated. MITSUBA SYSTEMS an ISO 9001:2000 company is a leading manufacturer of Powder Spray Guns (Manual & Automatic), Booths and Recovery and Powder Optimisation Equipment. Mitsuba powder spray equipments meets all necessary international approvals including ATEX & CE and are widely exported to Europe, USA and Middle East. You will find all the products and information you require to set up a State-of-the-Art powder coating unit. You can even watch videos of the equipments in action. We hope that you will have a pleasant and informative experience. Your valuable feedback is most welcome. Mitsuba looks forward to building a relation with your company for years to come. NEW DELHI: With environment on everyone's mind, fuel prices shooting and global warming hitting economies eco-friendly cars are ruling the day. They have become the hot item in the eyes of the public and more importantly the green item. One such car which uses compressed air as fuel is the "Air car." French company "Moteur Development International" (MDI) has researched and developed the MiniC.A.T . Tata Motors, India's largest automobile company, has signed an agreement with MDI for application in India of MDI's engine technology, and believes the engine is viable - It's press statement describes it as "efficient, cost-effective, scalable, and capable of other applications such as power generation". The MiniCAT could cost around $ 8177 in India and would have a range of around 300 km between refuels. The cost of a refill would be about $ 2. Although there is no official word on when the car will be manufactured in India, report says it will be sooner than later. Tata motors will also launch the world's cheapest car, Tata Nano for $2500 by October, in India. The MiniC.A.T which is a simple, light urban car, with a tubular chassis that is glued not welded and a body of fibreglass powered by compresed air. Microcontrollers are used in every device in the car, so one tiny radio transmitter sends instructions to the lights, indicators etc. There are no keys - just an access card which can be read by the car from your pocket. Most importantly, it is incredibly cost-efficient. According to the designers, it costs less than one Euro per 100Km (about a tenth that of a petrol car). Its mileage is about double that of the most advanced electric car (200 to 300 km or 10 hours of driving), a factor which makes a perfect choice in cities where the 80% of motorists drive at less than 60Km. The car has a top speed of 68 mph. Refilling the car will, once the market develops, take place at adapted petrol stations to administer compressed air. In two or three minutes, and at a cost of approximately $2.3, the car will be ready to go another 200-300 kilometres. As a viable alternative, the car carries a small compressor which can be connected to the mains (220V or 380V) and refill the tank in 3-4 hours. Due to the absence of combustion and, consequently, of residues, changing the oil (1 litre of vegetable oil) is necessary only every 50,000Km.] The temperature of the clean air expelled by the exhaust pipe is between 0-15 degrees below zero, which makes it suitable for use by the internal air conditioning system with no need for gases or loss of power. Zero Pollution Motors(ZPM) expects to produce the world's first air-powered car for the United States by late 2009 or early 2010. As the US licensee for Luxembourg-based MDI, which developed the Air Car, ZPM has attained rights to build the first of several modular plants, which are likely to begin manufacturing in the Northeast and grow for regional production around the country. And while ZPM is also licensed to build MDI's two-seater OneCAT economy model (the one headed for India) and three-seat MiniCAT (like a SmartForTwo without the gas), the New Paltz, NY, startup is aiming bigger, company officials want to make the first air-powered car to hit US roads a $17,800, 75-hp equivalent, six-seat modified version of MDI's CityCAT that is said to travel as far as 1000 miles at up to 96 mph with each tiny fill-up. Another car gaining popularity because of its features is the Mercedes-Benz Smart. On May 20th, 2008, the Environmental Protection Agency released its 2008 Report on the Environment (EPA 2008 ROE), a science-based report that answers questions about recent trends in human health and the environment. The report uses scientifically sound measures, called indicators, to address fundamental questions relevant to the EPA's mission to protect the environment and human health. These indicators were reviewed in a public forum prior to the creation of the report to determine if citizens (not just scientists) believed that the proposed indicators provided useful and technically sound data. One of the goals of the report is to eventually lead to the development of new indicators, monitoring strategies, and programs and policies in the areas that the EPA determines to be highly important based on measured environmental trends. The U.S. Environmental Protection Agency is amending the F019 hazardous waste listing to facilitate the use of aluminum in automobiles, light trucks and utility vehicles. This action will encourage motor vehicle manufacturers to use more aluminum parts, producing vehicles that are lighter. Lighter vehicles are capable of increased gas mileage and decreased exhaust air emissions, including greenhouse gas emissions. The LaFontaine Automotive Group, Highland, MI, has converted from using a solvent-based system for vehicle paint repairs to using Envirobase high-performance waterborne basecoat by PPG Industries' automotive refinish business. The transition is part of an overall initiative to sell, service and repair vehicles in an environmentally friendly way, according to LaFontaine. The company is one of the first in Michigan to move to a waterborne system. Dow Chemical Co. will talk with the Environmental Protection Agency about how to conduct a cleanup of dioxin-contaminated soil around 10 homes near the Tittabawassee River in Saginaw. Tests show dioxin at concentrations well above government cleanup standards. The homes are roughly 20 miles downstream of the company's Midland factory. It's the fifth cleanup 'hot spot' cited by the EPA related to a dioxin cleanup and the first in a residential area. Dow, which confirmed the negotiations Friday, did some initial cleanup in the area in 2005 and 2006. Midland-based Dow acknowledges that past pollution from its factory tainted parts of the area. 3 Jun 2008 , Leverkusen : With installed capacities currently growing almost exponentially around the globe, it is extremely important to develop more efficient production methods for the solar modules that are essential to this ever more attractive market. There is definite room for improvement here, as employees of Bayer MaterialScience were recently able to demonstrate. Light-resistant thermoplastic polyurethanes (TPUs) make it much easier to manufacture solar modules. A film made from Desmopan® has been developed in collaboration with ETIMEX-Primary Packaging GmbH based in Dietenheim, Germany. Leverkusen.– Bayer has been presented with the 2008 Environmental Award in the category “Environmentally Friendly Technologies” by the Federation of German Industries (BDI) for its new chlorine production process. This process reduces power consumption and CO2 emissions by 30 percent. As part of the “BDI Day of German Industry 2008”, BDI President Jürgen R. Thumann and BDI Director General Dr. Werner Schnappauf presented the prize in Berlin to Dr. Wolfgang Plischke, member of the Board of Management of Bayer AG responsible for Innovation, Technology and Environment. WEST BABYLON, N.Y.--(BUSINESS WIRE)--Xiom Corporation (OTCBB: XMCP), developers and manufacturers of the first completely portable polymer powder coating spray system, has brought to market four new coatings for use with its system. The coatings are all environmentally friendly and designed to protect structures against the elements, thus reducing the energy and materials costs involved in replacement. All of Xiom's coatings are environmentally friendly as they contain no VOCs. In addition, the newest coating—690--is TGIC-free. The U.S. Office of Occupational Health and Safety (OHSA) has established exposure limits for TGIC (1,3,5-Triglycidyl Isocyanurate), a chemical used to cure polyesters, but it is the only country in the word that has not banned TGIC. To avoid the possibility of the skin and respiratory conditions associated with TGIC's use, Xiom chose to develop a line of TGIC-free coatings. Two other coatings have been designed to prolong the life of wooden structures, thereby reducing the need for lumber. A polyester coating especially designed to be used on exterior woods, XT630 is a low-temperature-melt-and-cure powder that can be used on any heat-sensitive materials. Xiom's new XT742 is an epoxy-polyester designed to be used on interior woods. No pre-heating is necessary to apply this fast, low-temperature-cure coating. XT742 is ideal for wood and other materials like cardboard and plastic that can't stand up to high temperatures. PDF X300 is the first fluoropolymer that can be sprayed with Xiom's portable system. The coating is highly resistant to chemical corrosion. It is ideal for environments and industries in which acids and bases are present. Xiom's coatings engineers are also at work on a retro-reflective coating capable of reflecting sunlight as well as artificial light. When applied to roofing materials, this polymer-based coating will be able to reduce the temperature of the roof, bringing about significant savings in energy. An anti-static coating and an improved polyethylene coating will also be available shortly. Indian Powder manufacturers plan for a price rise. The inflation figure threw up a 13-year high of 11.05%. On May 16 Union Finance Minister P. Chidambaram blamed the rising prices of global crude oil for inflation in the country. Almost all leading paint makers like Asian Paints, Kansai Nerolac, Berger Paints and Shalimar Paints are likely to jack up prices of solvent-based paints by 3% to 10% due to a spurt in crude oil prices over the last few months. Crude oil is an important raw material for the paints industry. Some of the Powder Manufacturers have been talking about the effect of price rise in the basic raw material. Even the supply of these raw material has been a bit uncertain. Anshuman Dwivedi of Asian Paints confirmed "Considering the exchange rate /crude oil prices which is a major contributor in governing the prices of powders we are increasing our prices by 3-5 % in powders from Ist of July-08". Dr Hitesh Hirani of Neat Coat said "The the situation is truly not good. The prices of all the material had been gone up by almost 15 to 18% mainly in the epoxy, polyester and titanium dioxide. While on the other hand the selling price is steadily going down due to the competition or the market requirement. It is really impossible to withstand this sudden increase in raw material prices. All the powder manufacturers should have to join hands and increase the prices of powder"
AHMEDABAD: Small-scale paint units in the country are slowly turning pale in colour. The recent hike in price of Mineral Turpentine Oil (MTO), an important petroleum-based solvent, is set to accelerate the closure of the existing 2,000-odd units which are currently operating well below their capacities. “The price of MTO has been raised by about Rs 8,000 per kilolitre on June 3. This is the fifth hike this year,” said D Sivaram, the president of Indian Small Scale Paint Association. “Due to the increasing MTO prices, already 500 units in different parts of the country have downed their shutters in the last couple of months. And with this recent hike, the others left in the business will have no choice but to close down,” he told ET from Bangalore. After the recent hike, the prices of MTO have shot up to Rs 70,000 per kilolitre. Now the desperate association members are looking forward to their scheduled meeting with union petroleum minister Murli Deora next week at New Delhi. “We will submit a memorandum to the minister and will demand a cut in customs and excise duties similar to that done for ATF (Aviation Turbine Fuel),” Mr Sivaram remarked. Triggered by the sky-rocketing crude oil rates, the prices of MTO have been hiked 10 times in the last one year. The prices shot up from Rs 27,100 in May, 2007 to Rs 70,000 for a kilolitre of MTO. This year, the paint industry witnessed one of the steepest hike in MTO prices. The costs have nearly doubled from Rs 34,800 in January 2008 to the current Rs 70,000 per kilolitre, forcing about 500 units to shut shop across the country. Among the 500 closed units, Maharashtra — with 75 units — tops the list, followed by Gujarat and Tamil Nadu, where a total of 100 units have downed shutters. The smaller players have been unable to pass on the increased input costs as bigger players like Asian Paints, Berger and others have refused to hike the paint prices. June 23, 2008 -- For the second time in two weeks DuPont Titanium Technologies will raise prices in Asia for all titanium dioxide grades as the company tries to cope with increasing energy costs. Effective July 15 the business unit of DuPont, which produces titanium dioxide for the paper, coatings and plastics industries, said on June 20 it will increase titanium dioxide prices by US$150 per ton in all Asian countries except China. In China the price will increase US$0.22 per kilogram. The increase is in addition to one announced on June 5. Last time, it was a hundred horses kicking up a dust storm, making chhote sarkar look silly. Now it’s a helicopter, and it’s bade sarkar’s turn. Okay, so the great creative idea is to simply demonstrate the product benefit of ‘deewaaron pe dhool tikne na de’. Forget the confusing accents and badly-written dialogues; tell me, is a haveli-owner necessary in all films, for God’s sake? The first commercial was at least single-minded . This one’s got the man growing old too. Aha, I got it! This time the brief is not just ‘dust free’. INDIA’S LARGEST paint company-Asian Paints on Sunday (June 22) performed ’bhoomi pooja Model Township (IMT), Kharawar village of Rohtak district. The initial production capacity of the unit will be 1.5 lakh kilo litre (KL) and can be scaled to 4 lakh KL depending on market conditions. The chief minister of Haryana, Bhupinder Singh Hooda, unveiled the foundation stone signaling the beginning of construction work of the new plant. Hooda blamed his predecessors for the shortage of power, the state was encountering at present saying that previous governments failed to add to the power generation capacity of the state commensurate with the rising demands. Referring to his political opponents charge that the paints manufacturing unit would be a health hazard, Hooda said on this occasion that the allegations were baseless as the company had assured to stick to the zero discharge of effluents, which was also being followed in other plants of the Asian paints. Taking a dig at the opposition, the chief minister said that they were not able to digest the fact that developmental activities were going on at a faster pace under the present regime. He asked the opposition to shed the attitude of envy and come forward to play the role of constructive opposition, instead of merely indulging in blame game, to ensure progress of the state. Kolkata, Jun 7 Berger Paints has reported a profit after tax of Rs 92 crore on sales of Rs 1,522 crore for the year to March 31, 2008, against a PAT of Rs 83 crore on sales of Rs 1,322 crore in the previous year. It said the 15% rise in sales has made it the second-largest paint maker in India by sales. For the year, profit before tax was Rs 119 crore compared with Rs 102 crore in 2006-07. Consolidated sales in 2007-08 rose to Rs 1,586 crore from Rs 1,384 crore in 2006-07. Berger said it was able to deliver "steady topline growth" despite the lower GDP growth and slowdown in the automotive sector. The board has recommended a dividend of 25% per share, considering the costs of its expansion. The shareholders Kansai Nerolac (Q, N,C,F)* Paints at its annual general meeting held on Jun. 24, 2008, approved dividend of 120% for the year ended Mar. 31, 2008. The shareholders also approved the appointment of H M Bharuka as the managing director for a period of five years from Apr. 01, 2008 to Mar. 31, 2013. Further, the shareholders approved the appointment of Pravin D Chaudhari as a wholetime director for the period from May 01, 2008 to March 31, 2013. Shares of the company closed up Rs 1.1, or 0.18%, at Rs 613.65. The total volume of shares traded at the BSE was 208 (Tuesday). DuPont Titanium Technologies has announced a price increase for all of its "TiPure” titanium dioxide grades sold in Europe, the Middle East and Africa, starting 1 July 2008. The hike for customers in the Euro zone will be EUR 50/t, while dollar customers in eastern Europe, the Middle East and Africa will pay USD 200/t more. DuPont said the increase in the latter markets will be implemented in two increments of USD 100/t each, on 1 July and 1 October 2008. Also starting 1 July 2008, DuPont will apply a EUR 40/t energy surcharge to all TiO2 products sold in western and central Europe, Turkey, Greece and North Africa. PPG Industries, Inc., recently announced that its Architectural Coatings business unit will execute another round of price increases as a result of rapidly accelerating raw material and energy costs. The increases will be implemented during the third quarter of 2008 across all distribution channels. "The persistent raw material and energy cost increases that we continue to face are impacting every aspect of our business," said Scott Sinetar, vice president, PPG Architectural Coatings. "We have been extremely aggressive in reducing controllable, internal costs, but these measures cannot sufficiently offset the continuing market-driven inflationary pressures." Akzo Nobel NV (NASDAQ:AKZOY) AkzoNobel today announced that Tex Gunning will join the company as Managing Director of its Decorative Paints business with effect from September 1, 2008. Former CEO and Chairman of the Board of Vedior and a former Unilever senior executive, Mr Gunning (57) will be nominated to join the AkzoNobel Board of Management as member responsible for Decorative Paints at the company's next AGM in April 2009, completing the AkzoNobel board picture. Amid its economic boom, China has become the world’s second largest paint producer. China’s economic growth continues to be a remarkable story. The growth of China’s coatings industry also continues to be a major success. Coatings output increased from 2.98 million tons in 2004 to 3.82 million tons in 2005, while sales revenue rose by 21.84% to $9.14 billion in 2005. Total profit reached $550 million, a rise of 19% over the previous year. Although white, silver and black dominate the global mass auto market, car enthusiasts around the world are leaning toward various treatments of blue, according to leading auto industry designers and a global team of DuPont color designers. Volvo CE is investing SEK341 million (~$56 million) in a new paint shop in the company’s articulated hauler plant in Braås, Sweden. This investment will lead to an increase in capacity in the plant, a reduced impact on the environment and added improvement in quality, the company said. The total market for articulated haulers has more than doubled in recent years and current demand is greater than ever before. In order to meet this increased demand, during the past few years, Volvo CE has made running investments to boost capacity in the articulated hauler plant in Braås. It is now the paint shop’s turn and it will be replaced by an entirely new facility that will be completed in 2010. Changing paint schemes on military vehicles for rapid reaction deployment reportedly is quicker and more cost efficient using a peelable coating system developed by ANAC (Akzo Nobel Aerospace Coatings). Intergard 10220 is one of a family of specialty coating products tested and approved by the British Army for use on a range of military hardware. July 14-16 Sixth International Symposium on Contact Angle, Wettability, and Adhesion, Orono, Maine. Detection, Adhesion, and Removal, Orono, Maine. International Surface Finishing Academy Powder Coating Course, Mystic, Conn.
(i) installation of properly constructed spray booths with exhaust ventilation equipment to extract dust and maintain airborne concentrations below the OEL ( 5 mg / m³ ) within the workplace. Where manual application techniques are in use, the direction of the air flow should be from behind the operator, over the workpiece being coated and into the exhaust ducts. These should be situated as close to the workplace as possible. If the powder coatings concentration exceeds 10 mg / m³, respiratory protective equipment (RPE) should be worn in compliance with the local legislation. The operation and effectiveness of extraction and ventilation systems should be inspected, tested and maintained in accordance with national legislation. Allergy sufferer and people who have difficulty in breathing should not work in a powder coatings line. Ovens should be inspected, tested and maintained to ensure their operational effectiveness. (iii) facilities for jig cleaning should, wherever possible, be fully contained systems, with exhausts properly ventilated to a safe place. Where this is not practicable, employees should beprovided with appropriate personal protective clothing (PPE), including respiratory protective equipment (RPE) if necessary. (iv) All other stages in the handling of coating powders e.g. opening the packages, loading of hoppers, collection of unused powders should, wherever possible, be contained to prevent the escape of dust. Local exhaust ventilation and appropriate PPE should be provided in the event this is not practicable. dust respirators or air fed respiratory equipment will be required. In either case an adequate level of protection must be ensured. (VI) Eating, drinking and smoking should be strictly prohibited within the workplace. 4.2.5 Employees exposed to hazardous substances should be considered for health surveillance according to national legislation. (i) it can enter the body via orifices such as the mouth, ears etc. causing internal injury. (ii) it can penetrate the skin causing embolisms. (iii) particles in the air stream can damage eyes. (iv) pressurised systems can explode with violent effect when ruptured or damaged. 5.2.1 Compressed air should not be used for cleaning of clothing or skin. 5.2.2 The pressure system should be maintained in good repair and subject to periodic inspection. 5.2.3 suitable and adequate instructions for the use of the pressure system are provided to any person operating it. The instructions must include the action to be taken in the event of an emergency. Whenever I receive your newsletter, I know its 1st of the month! We have located your company through internet and would like to brief you on our capabilities. We are supplier in china of saturated polyester resin for making powder coating with environment protection.